The MSI Gaming Pro Carbon AC has a pretty standard appearance and uses a black PCB along with black physical components, such as the DRAM slots, the PCIe slots, the chipset heatsink, the VRM heatsink, and the back panel shroud. The back panel shroud, out of the box, comes in a black carbon fiber look to it, hence the 'Carbon' in the product name. This is detachable: included with the board are two different colored plates, one silver and one gold, which are interchangeable, or users can 3D print their own. This gives the board some added flexibility for fitting into more build themes. RGB LEDs are found in a few places on the board: firstly under the back panel shroud, then on the bottom side of the board under the front USB port and the debug LED. There are also LEDs in the audio separation line on the left side of the board that can be lit up as well. The motherboard supports five fan headers: a 4-pin SYS fan header above the 8-pin EPS power connector, two 4-pin connectors on the top right for the CPU and water pump, and two 4-pin headers on the bottom of the board. All fan headers support both PWM and DC control. MSI's documentation does not mention the power output of the headers. 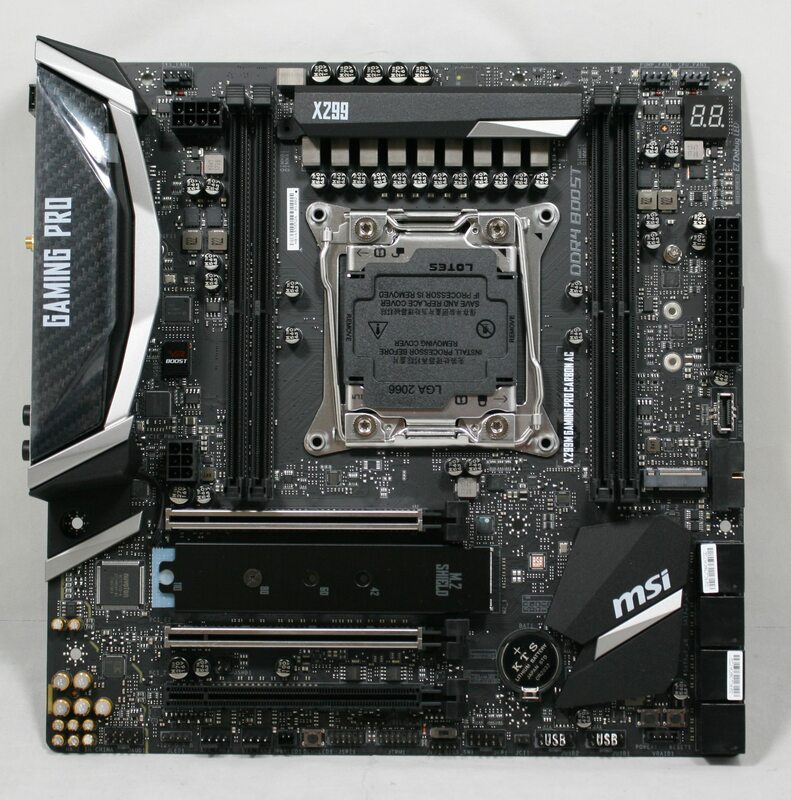 The power delivery used here is the same as we found in the MSI X299 Tomahawk. We count 9-phases, but know it is 4-phase and doubled by the Infineon IR3598 MOSFET drivers. Controlling it is an International Rectifier IR 35201 8-channel controller working with Nikos PK616BA and PK632BA MOSFETs. Sending power is an 8-pin EPS 12V connector located on the left side of the DIMMs . A concern with X299 based boards in some circumstances is the power delivery heatsink: with the X299M Gaming Pro Carbon AC, it worked fine at stock and when overclocked though it ran hot (details in the overclocking section). I would recommend getting this area actively cooled if you are pushing all core overclocks. This closer view of the top half of the board shows the four DRAM slots which use a one latch system to lock the sticks in place. 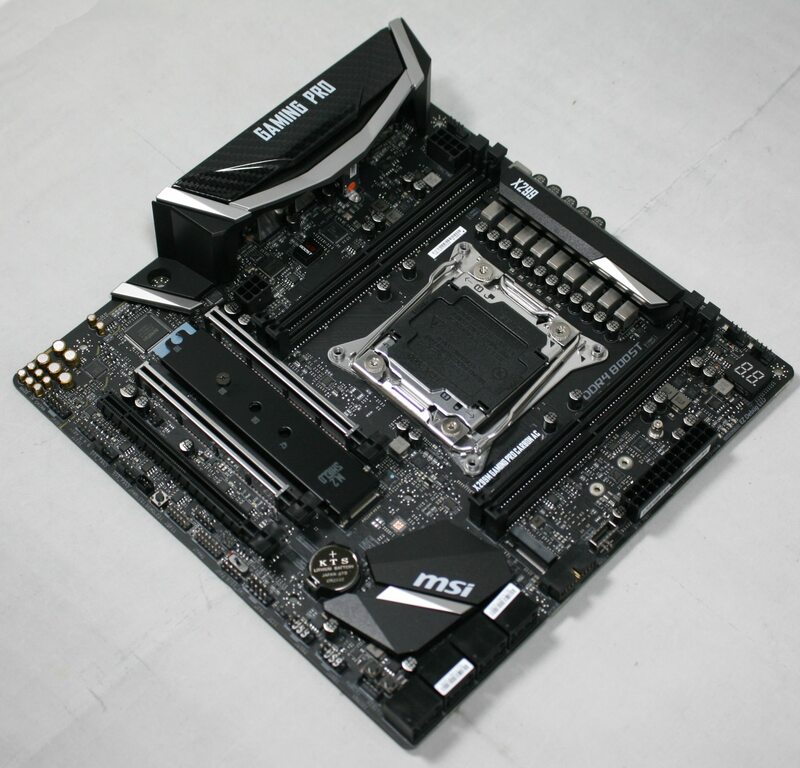 The four slots can support a total capacity of 64GB, and MSI lists support up to a fast DDR4-4200. The socket area is pretty busy with all of the caps across the top close to the socket. 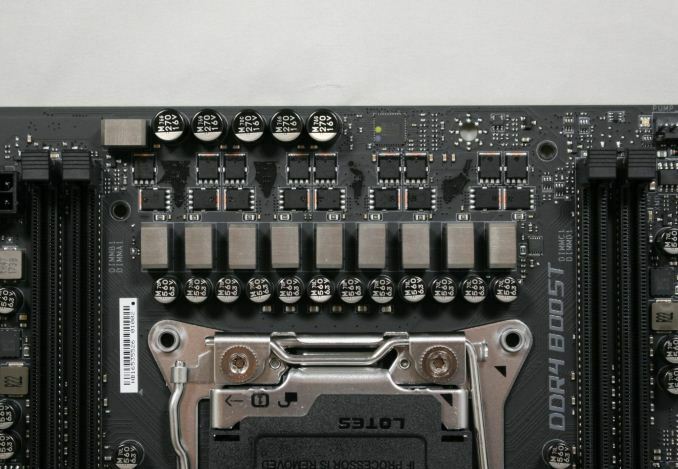 The right side of the board has eight SATA ports, a front USB 3.0 header, a front USB 3.1 (10 Gbps) header, and the 24-pin ATX connector. To the right the ATX connector are the EZ debug LEDs which light up when the CPU, DRAM, VGA, and BOOT segments are processed during POST. There is also a two-digit debug display. We can also see a more clear shot of the secondary M.2 slot just above the 24-pin connector. 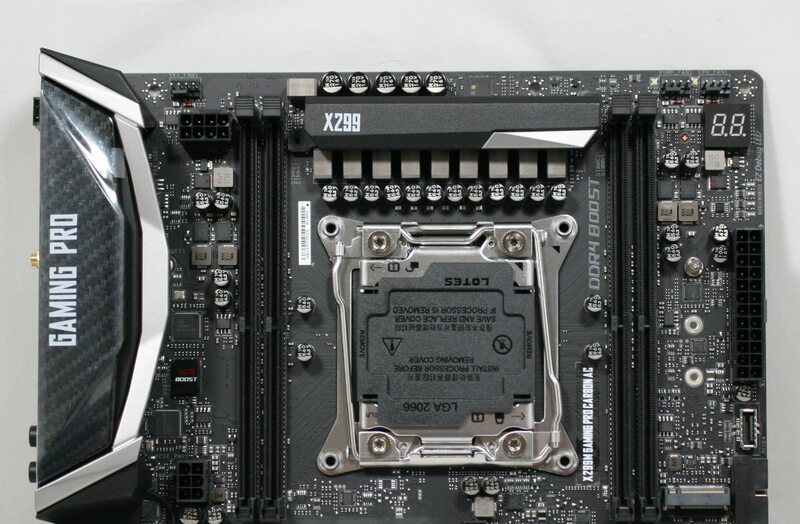 The eight SATA ports on the board are the full set from the X299 chipset, and support RAID 0, 1, 5, 10. Worth noting is that they share bandwidth with the M.2 slots when in SATA mode, with each slot taking its respective SATA port number out of action. Across the bottom are the front panel audio headers, an RGB LED header, two fan headers, two of MSI's custom headers, the front panel header, two USB 2.0 headers, BIOS/power/reset buttons, and a VROC header. The bottom of the board shows off the Realtek ALC1220 audio and its Chemicon capacitors on the left side, while the middle is taken up by the three CPU connected full-length PCIe slots. Between the two protected slots is the first M.2 slot which also has a heatsink on it and supports up to 2280 sized modules. To the right of that is the chipset heatsink. 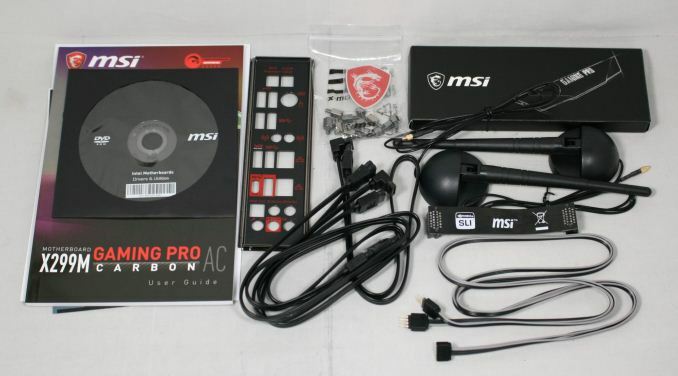 The board supports both AMD Crossfire and NVIDIA SLI technologies, but MSI does not mention Tri-GPU capabilities. Nonetheless, the third PCIe slot can still be used for graphics, albeit at the slower connection speeds. 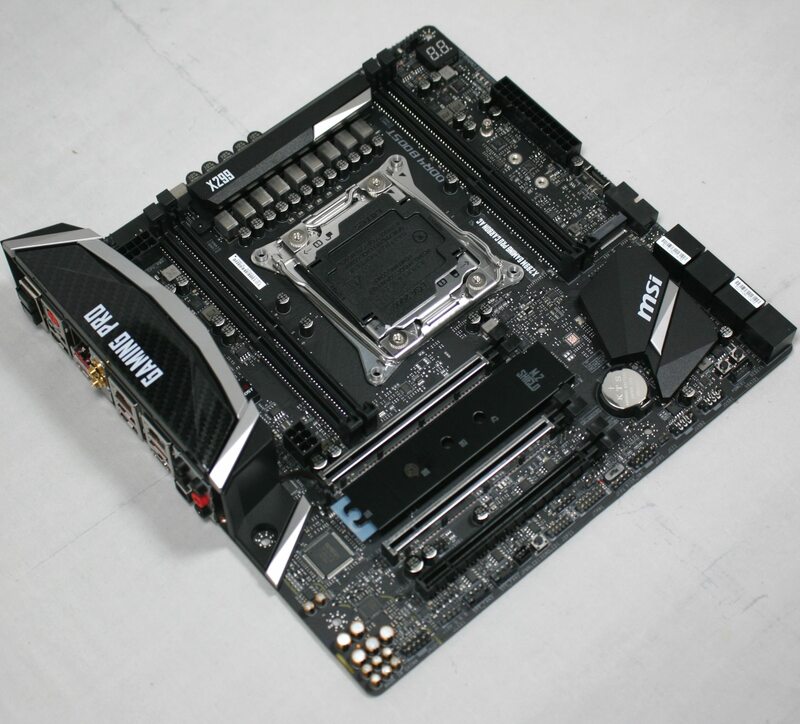 On the rear panel, from left to right, there is a BIOS flashback button, a clear CMOS button, a combination PS/2 port, two USB 2.0 ports (black), four USB 3.0 ports (red), an 802.11ac Wi-Fi card, two Intel network ports, two USB 3.1 ports (one Type-A, one Type-C), and audio jacks from a Realtek ALC1220. Obviously the novel thing here are the rear shroud covers in gold/black. However the box does seem a little minimal for a high-end product. There are plenty of points in buying that platform. It makes for excellent workstations, the added parallelism over an 8700K makes it worthwhile if you're doing anything reasonably threaded but requiring decent single-core performance as well. Of course Threadripper has taken a chunk of the workstation space higher up, so there's less of a point than there was when it was launched, but not everyone only does gaming on their system. But yes, if you want a pure gaming system then you'd go for one of the core iX-8x00s.